The purple line shows the Composite Reliability Index (CRI) of different energy-mix portfolios. Portfolios with high mixes of coal, nuclear and natural gas have the greatest electric reliability. Portfolios with large wind components tend to be more reliable than those with solar. But continued evolution of the resource mix — particularly the decommissioning of coal and nuclear plants and increasing reliance upon natural gas and renewables — could create reliability issues in the future. PJM is in charge of maintaining the integrity of the electric grid within its territory, which includes all of Virginia. The study analyzed a spectrum of “portfolios” with different fuel mixes to see how they would affect a variety of electric reliability attributes such as voltage control, frequency response, and the ability to ramp production up and down as needed. Of particular relevance to the ongoing energy debate in Virginia, PJM found that portfolios with 20% or greater of solar energy in the fuel mix would be “infeasible” because they would be unable to reliably meet night-time requirements. There don’t appear to be any upper bounds for natural gas, but excessive dependence upon gas could create vulnerabilities under a “polar vortex” scenario of sustained, bitterly cold temperatures. In Virginia, Dominion Virginia Power has emphasized the importance of fuel source diversity, including coal and nuclear. Dominion’s plans for nuclear, which include extending the longevity of its Surry and North Anna nuclear units by an extra 20 years and possibly building a third nuclear unit at tremendous expense at North Anna, have proven particularly contentious. Solar constitutes a small percentage of Virginia’s fuel mix but is fast growing, and environmentalists are pushing for a much bigger role. Across the PJM region, notes the study, the fuel mix has become more evenly balanced over time. In 2005, coal and nuclear generated 91% of the energy on the PJM system. But between 2010 and 2016, extensive coal capacity was retired and replaced mainly with gas and renewables. PJM’s installed capacity in 2016 consisted of 33% coal, 33% natural gas, 18% nuclear and 6% renewables and hydro. PJM has said in the past that the transmission grid was flexible enough that it could accommodate up to 30% renewables. Each fuel source has advantages and disadvantages in helping electric utilities balance electricity supply and demand while sticking to tight parameters for frequency and voltage. Coal and nuclear are less responsive to changes in demand, taking far longer to ramp production up and down. Wind and solar are easy to turn off but, due to the variability of the wind and sun, cannot be turned on at will. Natural gas tends to be the most flexible, and PJM’s most reliable portfolios include large contributions from gas. Electric batteries also would provide considerable flexibility, but PJM does not foresee them being deployed on a large scale within the time-frame of the study. Composite reliability indices generally improve as capacity shares of nuclear, coal and natural gas increase. When coal and nuclear units are retired and replaced, portfolios with the highest composite reliability indices tend to be ones in which natural gas is the predominant replacement resource. Bacon’s bottom line: PJM makes no judgment about the “best” fuel source mix, and it does not say that the most reliable fuel mixes are necessarily more desirable. If the goal is to increase renewables for reasons of reducing CO2 emissions, it is possible that some fuel mixes are reliable enough to accomplish both reliability and sustainability objectives. This entry was posted in Energy, Environment and tagged James A. Bacon, Nuclear power, Solar energy, Wind power. Bookmark the permalink. gas turbines can run and provide electricity for as long as you feed them gas… so not understanding the “uncertainty” issue. in fact, if you had enough gas generators you could run them 24/7 without a gap. The issue is the ability to supply the gas-fired generators with sufficient gas. That’s a matter of pipeline capacity. Jim is right. There are gas units designed to run 24/7 and others designed to cycle which are a little different, but that’s a subtlety. In general, gas units are fungible. Use them with solar if you’ve got the solar. Ditto, wind and water. But the sine qua non is, you must have a reliable gas supply to wherever the gas generators are located. Of course, those generators could be located way off in the gas fields and you ship the electricity instead of the gas. Wait a minute guys.. right now – there is more than sufficient gas supply in the existing Transco pipelines.. including gas from Marcellus Shale areas. we’ve posted the map of these pipelines before and TomH has confirmed there is ample existing supply and no shortage of places to put new gas plants near those existing gas pipelines. something smells in Denmark here.. AGAIN with Bacon’s narrative! Now I need to go back and more carefully parse what PJM has supposedly said… Why would PJM say such a thing if the Marcellus Shale is available in massive quantities to existing pipelines already? Glad to see PJM’s role getting some attention here. As they say, much more solar generation can be accommodated within the 13 – state PJM transmission system and regional energy market which is our local Grid. ” Portfolios composed of up to 86 percent natural gas-fired resources maintained operational reliability.15 Thus, thisanalysis did not identify an upper bound for natural gas. However, additional risks, such as gas deliverability during polar vortex-type conditions and uncertainties associated with economics and public policy, were not fully captured in this analysis. Risks with respect to natural gas may lie not in capability to provide the generator reliability attributes but rather in these other uncertainties. • More diverse portfolios are not necessarily more reliable; rather, there are resource blends between the most diverse and least diverse portfolios which provide the most generator reliability attributes. Nevertheless, the analysis shows that many of the potential future resource portfolios are likely to be reliable because they are likely to provide adequate amounts of the defined key generator reliability attributes. This observation holds true even for potential resource mixes that are heavily reliant on natural gas-fired generation and thus lack fuel diversity. History has shown that, despite having a system that meets reliability standards and requirements, rare extreme events, such as those experienced in PJM and other parts of the world, may produce negative impacts to the system that threaten the ability to continue to deliver energy services. methinks Bacon is “spinning” here.. PJM is talking about rare events that may impact ALL the fuel sources.. rather than Bacon’s angle about solar .. and “maybe” gas..
Basically the report is talking about fuel “diversity” and concerns that if the fuel supply for producing electricity becomes less diverse and more reliant on some fuels that, that could introduce vulnerabilities associated with things that can affect a particular fuel supply – for instance a disaster or weather might affect existing pipeline capacity.. for gas..
this article is NOT about the risks associated with renewables.. it’s NOT about the same old claim that renewables are “unreliable” because they are not “dispatchable”. The report asks what things might be done if we become more reliant on gas to identify potential vulnerabilities and to take steps to mitigate them. It’s a good read – and has a discussion about load-following dispatchability. Yes, the report is talking about fuel diversity. Yes, every fuel type has its weaknesses. That’s evil? no Acbar – they’re talking about fuel diversity – and rare events not about the “unreliability” of renewables. They actually discuss that relying on ANY fuel does introduce potential weaknesses and vulnerabilities that specific fuel might have to disrupting events from weather and other disasters.. like even the failure of a particular pipeline … or other infrastructure that generates or delivers electricity. I did not find that to be the general tenor of the article at all.. in my view… they’re talking about fuel diversity both with respect to portfolios and PJM region.. the future – and a narrowing reliance on gas and away from coal and nukes.. but over a long term…. and the context is way more than just solar but I found this chart much more relevant myself ..
re: ” Jim answered your question, simply and correctly. actually not. There is not a problem with pipeline capacity unless there is a rare and unusual event which is what the article did point out. there is not a problem with solar either – as long as you have sufficient gas-fired turbine capacity – which you would have no trouble providing right now because there already IS .. SUFFICIENT pipeline capacity – except in one of those rare events. You DO have to have ENOUGH gas generator capacity to cover the times when demand exceeds the coal/nuke baseload. you have to have that – no matter what. you cannot EVER .. RELY on solar or renewables to cover that gap – totally TRUE! and it’s also totally true you would never RELY on coal/nukes to cover the gap above baseload EITHER. Neither of those two things – mean you should not use SOLAR and renewables INSTEAD of gas – WHEN YOU CAN. and for that reason .. it’s not about “reliability” for solar. It’s about having enough gas capacity to cover the peak loads – 24/7 . That’s the gig. you have to do that – even if you did not have any solar at all. the benefit of solar – then is to use it as a cheaper and less polluting fuel when you can but NEVER to RELY on it – EVER. When you look at it THAT Way – there is no “issue” about the “reliability” of SOLAR … at all.. There IS an issue with GAS “capacity” during rare events.. storms.. solar vortex.. disasters.. and that does impact grid “reliability” and thus the legitimate subject of the report. HOW you come up with some other source of electric in that circumstance – is a bit of a quandary… since not only can you not (and should not) look to solar for backup but also not look to baseload nuke/coal for backup either… unless – you would be shedding excess baseload capacity from one part of PJM to another which needs it. but none of that report had much of anything at all to do with the fact solar as a legitimate fuel – when it is available, except to say that in the view of PJM that no more than 20% of portfolios should be solar or else you might have to rely “too much” on gas – of which, as far as I can tell, there is no replacement other than shunting excess coal/nuke within the PJM region from where it is excess to where there is need. There are several different things going on here! As Jim acknowledges, PJM concluded a while back that the PJM regional grid could absorb up to 30% renewables without system stability issues. So the presence of so much solar is not the problem. The problem examined here is, if the generation mix develops to include a lot of solar, what happens when the solar is NOT there. Well, obviously, you fall back on what’s left. Nuclear, coal and gas generation works just fine most of the time. Add a polar vortex weather event, which (not incidentally) is the circumstance that last threatened to take down the entire grid in the PJM region, and you get limitations on fuel availability. That last time, as I recall, it was (1) frozen rivers preventing barge deliveries of coal and oil, and (2) gas storage in the Northeast/Midwest was depleted, and (3) gas pipelines from larger storage in the Oklahoma/Texas region were unable to make up the difference, and (4) PJM barely made it through by relying on appeals for reduced energy consumption and maximum imports of electricity over its transmission connections to areas not as adversely affected by the weather. This historical event makes one ask: what if there is less nuclear and coal available because some of them have been retired because all that renewables generation has displaced them under normal circumstances? In other words, is the grid’s resilience further impaired? I agree with you, as long as there’s enough new gas generation to make up the difference and there’s adequate gas available and deliverable to keep it running, you can get through the next polar vortex event. Apparently PJM has concluded, using something they invented called the “composite reliability index,” that going over 20% solar would be “infeasible.” I don’t know the context for that statement, or what hypothetical system conditions were examined, or what the terms mean exactly. But: it sounds like a cautionary statement aimed at the FERC and our mid-Atlantic State regulators. Given California’s experience, where more solar has been built than they know what to do with, and where the gas supply is limited, as the direct result of State government policies which over-incentivized and over-mandated solar construction, I think PJM is quite right to say to our State regulators, “look before you leap.” PJM cannot tell its utilities or independent generation developers what to build; it will deal with whatever generation shows up, but PJM is wise to say to everyone affected, if this happens, that is the consequence. Why is 20% the maximum that’s “feasible” for solar? You are correct, it’s not because the system can’t handle that much solar. Jim is correct, “The issue is the ability to supply the gas-fired generators [in PJM] with sufficient gas. That’s a matter of pipeline capacity.” You are correct, “none of that [PJM] report had much of anything at all to do with the fact [of] solar as a legitimate fuel.” I think we’re in ‘violent agreement’ here. So what’s Jim said that was so evil? you NEVER do rely on solar in the fuel “mix”. You MUST be able to cover what baseload does not – with some resource 24/7 … and you’d NEVER have solar in that mix. So that basically means you have to have enough GAS to run 24/7 .. to cover the entire gap that baseload cannot cover. Once you have the 24/7 gas .. it ALLOWS you to use solar on a discretionary basis – WHEN it is available ..but ALWAYS will the ability to use gas if it is not. so it’s never going to be about solar… it’s a fuel of opportunity – not reliance. that does NOT mean it’s not MEGA useful. The problem is – it’s not lucrative .. not a “profit” center for the utilities who monopoly “handlers” would REQUIRE them to pass those savings on to ratepayers .. so of course Dominion and company, with Jim’s help – want folks to think of solar as a “bad” thing and that we should not have to much of it because it’s “not” reliable. It’s a misleading narrative.. and when repeated over and over – it’s evil. Well here’s a question back at you. Do you think that PJM is ALSO saying that there is no replacement for baseload nuke/coal – either? That if those fuel sources go away that we WILL be TOO reliant on one fuel and yes.. it WOULD be vulnerable to disruption? Here’s another way of looking at it. Do you think we can (or should) use only gas 24/7 and let coal and nukes go away entirely? Do we have any real expectation that gas could go 24/7 for 50, 100 years with only solar as it’s sidekick? It wasn’t clear to me, reading through the article sorta fast, whether distributed solar and wind were included. 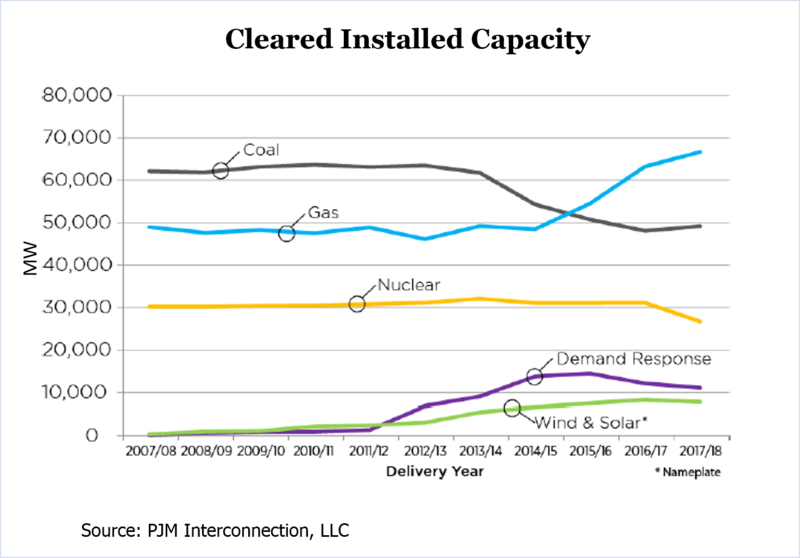 PJM only started counting on-site solar last year. DERs would make the calculation different. I like the approach … isolate and fix the problem spot while maintaining the whole. so ask you the same question CAW. Can we operate the grid without any coal or nukes? We just use gas 24/7 for baseload and peak – and solar when it is available? Those guys sure know more than I do about what is possible. but I just don’t understand how we can do what they say without baseload and/or some fall-back generation if the non-fossil fuels come up short. I am late to the party. I have been off giving talks in SE Virginia about the adequacy of existing pipelines to meet the needs in VA and NC. I have just skimmed some of the information here, so I might be missing something. I would like to clear up a misconception about the polar vortex. In both PJM’s and FERC’s post mortem of the event (and I am grossly oversimplifying) the need to curtail customers (especially in Virginia) was not due to a shortage of natural gas or a lack of sufficient pipeline capacity. It was primarily caused by a poor human-designed and human-managed dispatch processes and the fact that the gas dispatch day did not correspond to the electric dispatch day. Gas and pipeline capacity was usually available but the gas did not get to where it needed to go. Some improvements have been made with this and more is on the way. The other major cause was that many peakers were frozen and would not start when needed. This is an essential point. We can’t manage a 21st-century energy system the same way we managed a 20th-century system. But it also means that we should not judge the value of the new energy technologies based solely on the methods and tools that we we currently use. Over the next 15 years we will have a more diverse mix of generation. The sharply declining capital cost and no fuel cost for renewables and storage will make those choices increasingly attractive, especially to customers. We traditionally do our energy planning from the utility’s point of view. If we took a customer’s viewpoint we would see that the most important strategy would be to keep Virginia’s electricity demand stable or declining. This might happen anyway but a more concerted effort to improve the energy efficiency of buildings would save us all money. Energy efficiency is available every hour of the day, every day of the year and is more reliable than any source of generation. It would also mean that we do not need to build any new baseload power plants after Greensville. We could add solar and wind to a significant degree over the next 15 years and lower our overall cost of energy. The baseload plants could operate at their projected capacity and pay their way. Low-cost intermediate load units or purchased power from the growing surplus in PJM would cover outages of the baseload units. The existing intermediate and peak load units would be retired over time as renewables and storage are able to economically fill the gap, avoiding stranded costs. But the existing units would be available to fill in when the renewables sources vary or are not available, without requiring new investment. During the next 15 years we would invest in the necessary technology to have two-flows of energy and information throughout the grid. Many of the issues with a growing contribution from renewables would no longer trouble us. Dominion has an effective subsidiary that does this work and they should be well paid for it in their own service territory and they could profit by helping other utilities in the state. The decline in electricity use and the lack of need for the ACP and more combined cycle units would be a shock to Dominion’s business model. This is why the new rules that Jim mentions would be so important. We need a financially healthy utility to create a 21st-century grid. They should be fairly paid to provide the services that have value to their customers, perhaps with performance based rates. They could earn more when they serve us better. This is far better than a continued build-out of unnecessary infrastructure just to keep their earnings up. The price declines of the new energy technologies will survive the demise of the CPP and attempts by the administration to increase the use of fossil fuels. The lower priced renewables will eventually undermine the 20th-century technologies long before they have been fully paid off. This outcome would be bad for the ratepayers, the utility shareholders, and for Virginia’s economy. That is why we must address the issue now, before the investment decisions are made. There is adequate pipeline capacity in our region (several times greater than the ACP). This can accommodate either the low-usage or high usage scenario, without a $5 billion investment paid for by the ratepayers.We should not be frightened by claims that “we don’t have enough”. We have plenty of time to make a thorough investigation of our choices and to choose the wisest path for our future. One of the take-aways from the PJM report seems to be a concern that if coal and nukes are going to shrink in numbers that we will become more reliant on gas and there are inherent vulnerabilities that come with less fuel diversity especially at the portfolio level – and those portfolios will be more vulnerable, more dependent on PJM for help .and less able to help others also if they have an “issue”. One of the things that makes PJM “work” is the premise that each portfolio ADDS to overall reliability as long as each portfolio’s own reliability house is in order and unless there is a region-wide disaster – unaffected or less affected portfolios will be able to help the ones in distress. Part of that means that portfolios with good baseload may well be able to assist and/or free up gas turbine plants being held in reserve. But if the individual portfolios become less and less able to help others and at the same time more vulnerable to needing help themselves – then the basic concept of PJM becomes problematical. And I agree – that solar won’t help and too much solar in a given portfolio make render it less capable of helping other at times.. and I further agree that if portfolios lose baseload by the closing of coal/nuke plants that – that does introduce more risk… more reliance on gas..
so the report is basically fretting ..and worrying about the evolution ongoing and , yes, at the end of this – they may be an argument for keeping or even building more nukes… if we are actually going to have a 3-legged stool – grid… baseload – peak load – discretionary/harvestable renewables when available. Virginia will have gas, coal and nuclear contributing to baseload generation through 2032. The coal might be near retirement then. I don’t know when the Mt. Storm plant went into operation, but coal won’t have a long-term future with CO2 as an issue. The first Surrey plant will be 60 years old in 2032 and I would expect that it will take significant and expensive retrofits to make it safe to operate for 80 years, if that is possible. Nuclear is just such a bad fit for the direction the modern grid is going. We are heading into a very diverse, very flexible grid, that is best suited to rapidly responsive sources of generation and demand response. Nuclear is exactly the opposite. It only runs well at a stable level of output. Plus it is so much more expensive than any other option. North Anna 3 will be at least 20 times more expensive than a comparable combined-cycle unit. And in 15 years probably 20-30 times more expensive than a renewable-storage combination. I know others see a value in nuclear but there is no evidence that you can get a nuclear plant built on schedule and on budget. The real-world results are exactly the opposite (note the Westinghouse bankruptcy and the delays or possible cancellation of the Vogtle units in SC). The future energy system will be much more diverse and adaptable than the current baseload/intermediate/peaking categories of generation. TH, I am one who sees value in nuclear power, especially for environmental reasons — but not at NA3 prices! But the most important point you make (not for the first time) is that investment in customer energy efficiency should be seen as a utility resource. Certainly today’s Wall Street knows how to reward utility construction of iron in the ground, but load management and customer efficiency and distributed customer-owned generation don’t grow the rate-base, don’t grow earnings, don’t grow sales — even if the utility understands how these are the future, Wall Street today doesn’t reward going there. How can the SCC, for example, buck that trend and give its IOUs the financial incentive to build less and keep demand flat? We are hardly the first to consider this regulatory conundrum but you’ve spoken in favor of energy efficiency investment consistently so I’m quite curious how you feel about it. I guess we are all shaped by our experiences. Mine included participating with two utilities in the engineering and environmental studies for thousands of megawatts of nuclear plants that were never built, costing ratepayers hundreds of millions for projects that gave them no value. I see the same prospect for NA3 and the several new nuclear units that are under construction today. Besides the inflexible operation issue, it is the economic and environmental issues that concern me today. I have covered the order of magnitude higher costs, but the environmental issues also disturb me. We have over 100 nuclear sites, many near densely populated areas, that will soon be decommissioned and are currently the nation’s waste fuel depositories. They are totally dependent on the uninterrupted flow of water in the spent fuel pools to keep them safe. We have no plan or even any movement towards a plan for the safe, long-term disposal of those radioactive wastes. It doesn’t seem responsible to expand the problem when we have no means of solving the current situation. This is the million dollar question that regulators throughout the nation are beginning to wrestle with. It is the transition period that is especially difficult. We must continue to pay the cost-of-service rates for all that has been built but not yet paid for. There are various methods for rewarding utilities for the new types of services they will perform and some variations in what the regulators want those services to be. Massachusetts and New York are two of the states that are leading this transition. Massachusetts has decoupled their utilities from owning generation which has made it easy for the utilities to participate in the state’s ambitious goals for energy efficiency. In New York, the utilities own their legacy units but are not allowed to compete with third-parties for renewable projects (at least not through their regulated enterprise). They are being reshaped as Distribution Service Platform providers (DSPs). They will take care of the wires and the customer transactions and will provide a system to pass through charges and billing for third-party services. They are considering performance-based rates for a wide variety of services. The transmission is handled separately through the NY ISO. Wall Street has seen this transition from big iron to services. GE and IBM come to mind. Corporations can be financially rewarded for making this shift, but it is often difficult to adjust the mindset of the employees. I believe that if investors were more aware of the potential for stranded assets or at least declining financial performance from staying too long in the 20th century, I think they would reward the move to more modern regulatory schemes. The utilities in New York were not asking for a change, but once they saw the lower risks and greater potential for gain in the new system, they have all come on board and developed many changes to take advantage of the new regulatory environment. I think it will be harder to accomplish in Virginia. We have historically followed the lead of Dominion and I think they would prefer to be in complete control even if it will cost them and the rest of us in the long run. Without a governor and state legislature leading the charge, I am not certain how to show Dominion that there is a better future for them too. “science” determines that gas is worse than coal from a climate point of view. Current science regarding methane leaks is telling us that using natural gas for electrical generation has the same climate consequences as a coal plant. This is why most current discussion of natural gas generation just talks about CO2. That along with poor economics is why I am recommending providing any new increase in demand with energy efficiency rather than new natural gas plants. Energy efficiency is much cheaper, better for the environment and saves all ratepayers money. It is just not as good for the utilities until we change the rules. Ok – help me understand the concept of base load – right now – and what it would be (or not) in 2030+ with coal plants in much few number and nukes winding down also. My understand is that we have a 3-legged stool …. 1. – baseload that is “always there” … and enough to cover minimum required electricity capacity. 2. – peak load – comes online when demand exceeds what baseload is providing. 3. – wind/solar that can be used “when available” to offset how much gas is needed and a nuance – only when higher demand than baseload can supply is occurring. In other words – solar/renewables are basically incompatible with fixed-output baseload. and a corollary – in a world without baseload – how does a grid operate and maintains reliability? I only see 24/7 gas turbines and an ability to run less of them when solar/renewables are available. I’m totally on board with renewables.. but we have to be realistic if we want it to actually work and not suffer an energy-type dot.com bust.. from too high expectations and no answers for what powers the grid if renewables fall short at times. we have a have a good answer.. one that does work … and I fear the kubaya perspective of the pro-renewable crowd. I dislike, even fear the damage that might be ongoing from fossil fuels but the brutal truth is that renewables do not work – without gas and gas may well be a more potent generator of greenhouse gases than coal which would turn out to be a hell of a dilemma if true because there is no way on Gods green earth that renewables can power the grid by themselves – right now at this point in time -and probably not in our lifetimes even those in their 20’s. 1. Baseload – these terms apply to the demand side although we are accustomed to applying them to certain types of generation. You are correct in saying that this is the minimum load that exists throughout the day. The amount of the “base” load will vary in different seasons. Historically, this demand segment has been met by conventionally fueled generation such as coal, oil, nuclear and natural gas. In areas, such as California, with a high proportion of renewables the contribution from these lower cost sources can cut into the amount of generation needed from conventional sources during various times of the day. Solar will reduce the need for baseload generation during the sunniest time of the day. Wind generation, which is often greatest during the night can offset the need for nighttime baseload generation, which particularly complicates the operation of nuclear units. In some high generation cost situations, such as Kaua’i, a solar plus battery combination is cheaper than the fossil fueled baseload generators. 2. Intermediate load – this type of load occurs during the common human activity time of day from 5 AM to midnight. Wind and solar can contribute to meet this demand but dispatchable units must be available to fill the gaps when the renewables are not available. 3. Peak load – this is the 12-14 hours of highest electrical demand during the day, with the highest loads occurring during a 4-6 hour period usually during late afternoon or early evening. If solar has contributed a significant portion of the daytime intermediate and peak load, the grid can be challenged by the need to quickly ramp up for the late afternoon/evening peak as sunlight declines. Hydro is often used to meet peak loads to receive a higher energy price. I am not exactly certain what you mean by renewables being “incompatible” with fixed-output baseload. I have described how wind and solar can be used to meet baseload demand, with or without storage. However, contributions from lower-cost renewables can significantly complicate the operation and economics of units that are not flexible in their operation and need to run 60% or more of the time in order to be economic. This is the real challenge in the next 10 years. Storage is not yet “cheap”, although it is economic in several applications today, especially if those uses can be “stacked”. Batteries can be used for backup, for load shifting (to a different time of day), for frequency and voltage control, etc. The same battery can have multiple sources of revenue when used for all of these functions, so they can be economic today. As prices continue to decline, they can be used as rapidly responsive peaking units and storage units to move daytime solar output into the evening peak and perhaps eventually displacing the need for nuclear baseload in Virginia. This allows conventional baseload units such as coal and nuclear to run more consistently, while using the cheaper renewable energy to meet evening peaks. Balancing all of these inputs in a reliable way over the next 10 years is a challenge several utilities are already dealing with and many are hoping to avoid by obstructing the greater utilization of renewables. I recommend that we make this process easier by using energy efficiency to avoid the need to add new generating capacity. Building new units that might have only 10 years of economic use does not make sense. Utilities do it because they want to provide reliable power. Plus, they also are assured a 40-year stream of revenues whether the plants have value to the ratepayers or not. There are new faster responding peaking units available, but why invest in them when batteries will do an even better job in a few years, cheaper with no emissions and no fuel costs. If we create the right regulatory schemes, we can get through this 10-15 year period and many new technologies will be developed to lower our costs and make managing the grid much easier. There is also the prospect that entirely new means of producing energy will come along. It won’t be too long before it all is sorted out and we will wonder what all of the fuss was about. I remember people telling me that we would have the old mainframe computers “until the end of time”. We don’t see them around today. my understanding… is that baseload coal and nuke cannot ramp up and down quickly and can take hours which means it cannot change it’s output quickly enough in concert with the variability of solar. so say you did not have gas and only baseload/coal/nuke . and it covered the morning hours but was insufficient in the afternoon – in which solar could cover the gap IF solar was available and it was not raining , etc. If there was rain… what would cover the shortfall since the nuke/coal cannot ramp up? solar is incapable of covering the gap from baseload to peak .. reliably ..
it MIGHT if there is lots of sun but if it is raining or nighttime -it cannot. what do you do then? I say you use gas.. and further if you want 100% reliability – you must have gas “available” 24/7… and that means that solar is only useful if the gas can quickly ramp down so the grid can use the solar. if you had no gas – your baseload would have to cover 24/7 any demand so it would run at whatever high level it had to – to be sure to meet any demand. It cannot coordinate with solar when solar is available. Fast markets: The cheapest approaches involve adapting market rules to accommodate renewables. Simply stated, these tools, such as sub-hourly scheduling and dispatch, allow markets to adapt more rapidly and closer to real time to changing wind and solar conditions. For example, ERCOT and MISO have five minute, real-time energy markets. These “faster” markets are more efficient and reliable, and reduce reserves needed to balance the system. Expanded grid operating areas: Larger operating areas allow grid operators to access a wider array of resources, thus mitigating variability, ensuring reliability, and lowering costs. For example, the Western Energy Imbalance Market (EIM) was launched on November 1, 2014, with the goal to connect disparate balancing authorities across California, Oregon, Nevada, Washington, Utah, Idaho, and Wyoming. In fact, one of the reasons this occurred is because of the recognition that having a larger grid operating area is essential as the amount of renewable energy resources continues to grow. The California Independent System Operator (CAISO) just released its quarterly assessment of the EIM, quantifying benefits of $64.6 million since its inception. These benefits are related to more efficient dispatch, reduced renewable energy curtailment, and reduced flexibility reserves needed. Flexible demand: Another way to provide flexibility to accommodate RE is implementing approaches that allow demand to be managed. Demand response (DR) programs can participate in capacity and ancillary service markets, and help load balancing during large supply losses. For example, more than 10,000 MW of DR resources were procured in the most recent PJM capacity market auction for the 2019/2020 delivery year. The article adds storage and felxible generation too. The baseload coal/nuke cannot ramp up because it is already running at 100% capacity 24 hours a day in its baseload mode. The intermediate and peak demand periods would be covered by solar, however much is available, and the balance would be provided by the existing cycling units (gas, oil, biomass, etc) and the shortfall in the peak would be met by gas and oil-fired peakers, hydro, and pumped storage. We have to be careful about how we speak about this. The specialized weather forecasting tools that are now available to utilities allow them to very accurately forecast the future output of their wind and solar installations so that ample capacity is always available to cover the reductions in output from renewable sources. Variability does not mean lack of reliability. Gas-fired units, especially peakers, are very handy to respond to variations in demand of any type. But if you have 30-60 minutes notice of a significant decline in your solar output, you can bring up the next cheapest units into a spinning reserve situation, or a variety of other choices depending on the situation. Loss of solar is usually only partial if the units are widely distributed (which is a reason not to rely only on large utility-scale solar units). If there is a large front moving in with substantial cloud cover,the power control centers have a good deal of time to anticipate a decline in solar contribution and make appropriate changes in the generation mix. Solar will not go out like a light switch throughout the grid. Although, that image has been talked about as a reason we should not rely upon it. The baseload units will run at 100% 24/7 regardless of what is happening with the intermediate and peak loads. Baseload is only affected when the contributions from renewables exceed what is needed by the intermediate and peak loads and it cuts into the need for conventional units to supply baseload demand. This is what is happening in California and Ontario. Then it is the combined cycle units that are turned down or off, because the coal and nuclear units cannot vary their output quickly. and if you do not have gas as a fuel – how would solar “work” with baseload? see my point? you HAVE TO HAVE gas for solar to “work”…. solar, by itself with baseload would be a disaster. and my further point ” “solar is incapable of covering the gap from baseload to peak .. reliably”.. even with good forecasting… my point was that solar without gas .. is a no go.. if baseload cannot ramp. In that scenario – solar would have no real value because it could not be used instead of baseload. it CAN be used instead of GAS – when solar is available – as long as gas is capable of ramping up when solar goes away. and CAWs points are basically PJM-type resource sharing, right? Well, I guess where we differ is that you some seem to say that we should not develop renewables wherever they make economic sense today.You keep posing a hypothetical that we cannot use renewables without gas. Natural gas-fired generation is the largest single segment of our nation’s grid today, recently surpassing coal. So we do have gas to do exactly what you are describing. We don’t have to wait for anything. What I am suggesting is that we don’t need to develop any more gas plants, especially if we use energy efficiency to halt or decrease demand so that all of our current baseload capacity is sufficient to meet our needs. Meanwhile, costs will decline for both renewables and storage so that eventually we will have an alternative baseload source as gas, coal and nuclear get increasingly expensive or too environmentally risky. Most utilities agree with this approach, which is why 65% of all new generation additions in the US were from solar and wind last year compared to just 29% for natural gas. This is not a solar cheerleader approach but purely based on the current cost and technology trends in the energy industry. Technology is accelerating everything in our society. If we stick with an old technology that requires a 40-year payoff far too long, we will pay a heavy price, just because we cannot stretch our minds enough to imagine other possibilities. well I don’t think we differ that much. I would LOVE TO SEE a day when we are predominately solar and renewables but each of us thinking that -are also thinking that if the solar recedes.. we’ll just switch over to grid power.. but what exactly is that? what is it that we are going to depend on when solar/wind are not up to it some days? totally support energy efficiency – the ability of the utility to cut water heaters and air conditions… totally in favor of smart meters and smart thermostats that cut the heat and air conditions when no one is home. storage I’m all for – but it’s simply not here as a viable technology for anything beyond short bursts to buffer load shifts. I’m pretty skeptical about it to be honest. I don’t doubt it is possible -for a price – but that price is not feasible for most folks who are not going to spend 20-40K up front for something that still will not run the house 24/7. we’ll get there.. but not for a while.. so the issue is what do we do until we get there? right now? I say it has to be gas. and gas is what makes solar “work” . without gas – solar is not grid compatible. And if thousands of people install it in their homes – all they will accomplish is to undermine the fiscal viability of the grid. Let’s assume a super-PJM region where any available generation in that region can be instantly shunted to wherever in the region needs it. but what do you do at night when the wind is mostly calm throughout the region – not near enough to cover the demand? You’ve got three choices : coal, nukes or gas. Now, it might well be interesting to know if within the PJM region there is actually enough baseload generators to supply all the needs of the region even at peak and the main problem is primarily a grid that is not modernized enough to squeeze out every bit of it and get it all to where it is needed. I’d include existing pump-storage but not new ones not even planned because the sites for those facilities are few and far between and very consumptive of land and very expensive. I’d believe a comprehensive analysis of potential sites , costs and time to develop but again – these are not likely potentials. I’d believe other innovations .. like perhaps in-river upstream pumping via solar that then comes downstream to drive turbines at night. I’d believe a comprehensive analysis of onshore and offshore wind , costs, and time frame to develop. but right now – today – even with a lot more solar – how would you deal with nighttime and early morning start-up? the biggest problem we have right now – in my view – in twofold – First, the utilities like Dominion do not want innovations that ultimately hurt their own bottom line.. they’re never going to do that and second – the part that actually helps DOminion are the renewable-only “dreamers” who advocate for things that are not real – and when undercut by the fossil-fuel folks – they lose credibility to the general public.. who view them a enviro-weenies and not legitimate players in the issue. we have to fix that – .. if we are going to move forward. We don’t have to assume it. It already exists. It is called the eastern interconnect zone. It includes all of the ISOs east of the Rockies (PJM, MISO, NYISO, NEISO, ERCOT, and all of the other states, especially in the South that do not belong to an ISO). It is fully interconnected and power can be shunted to wherever it is needed. Wind is caused by changes in temperature and pressure so it is usually blowing somewhere, especially in the Great Plains, but you would have to design the grid so that there is sufficient generation to cover the demand when wind energy is low. Offshore wind would help even out the onshore wind contribution. The current grid can get electricity to every place that it is needed. It would be a very poor choice to create enough baseload plants to meet the peak loads. That is not what they are designed for and they would be very inefficient at meeting that need. Think of baseload plants as being like tractor-trailers. They are most useful when carrying a large load and running down the highway at full speed. It would be expensive, hugely inefficient and very cumbersome to drive to work in one. Local delivery trucks (box trucks) handle a medium amount of load very efficiently and work from the early morning into the evening. These are like the intermediate load (cycling units). Cars are much cheaper than trucks and are easy to maneuver and are great for short trips. They handle the heavy commuting traffic and local errands for a few hours each day. They act like peaking units. One type of vehicle is not suited for all tasks. Expecting baseload units to meet the peaks is unrealistic and expensive. What is happening now is that new types of “vehicles” are coming on to the scene (renewables) that provide cost and environmental advantages over the “vehicles” we have traditionally used (coal and gas). If for some reason the new vehicles cannot run, we can roll the old vehicles out of the garage and use them whenever they are needed. But we don’t need to buy more of them if they are going to be unused much of the time. This is especially true of the tractor-trailers.We should pack them more efficiently so the same number of semi’s can carry all of the goods we need. This is far better than buying new ones that run only half full and lose money. I do not believe that any serious energy planner is advocating options that are “not real”. Even the “enviro-weenies” that you describe are not calling for an immediate replacement of all forms of generation by renewables. We need to avoid the ideological arguments that exist on both ends of the spectrum and focus our efforts on selecting the lowest-cost, cleanest, and appropriately reliable options that meet our energy needs. That will happen the fastest if we remove the rate and economic obstacles that are keeping many utilities from focusing on the best ways to develop our future grid. TomH – I don’t think you understand what I am saying. I’m NOT saying that we should have baseload to cover all peaks. we DO COVER the PEAKS? and we CANNOT cover the peaks with renewables..
we CANNOT have a grid that is baseload and renewables ONLY.. because renewables are not reliable enough to cover the peaks – all the time – and in fact there ARE going to be nights where there is NO SOLAR and not near enough wind to cover the peaks. we have to have a generation type in between the base and the renewables to handle the peaks when renewables cannot. If you want MORE renewables – the most you can have is what is not handled by the baseload but without gas you were introduce great risk of lower reliability because when the renewables fail to generate enough -you MUST have gas to pick up the gap. what I’m AM pointing out that if you did not have the gas – that renewables would be totally incompatible with baseload alone – and you’d THEN need a baseload that would cover the grid entirely regardless of the renewables. You say it would be grossly inefficient to do that. I agree. But that’s exactly what we did back when we did not have gas… and peakers/intermediate load (which is also gas). the entire point here is that renewables don’t work without gas… right now – today..
and a quibble – if we can get electricity anywhere from anywhere then what’s the discussion about Skiffes Creek and other grid upgrades necessary to get electricity from one place to another – reliably? You are right, but not right. Two comments. First, about reliability. It isn’t just Dominion that is concerned about reliability. The system operator, PJM, has to worry about it, and the VSCC and FERC know they’ll catch political hell if they don’t worry about it, and the NERC and its regional arms around here, MAAC and ReliabilityFirst, who set the reliability standards that PJM and Dominion must meet, worry about it ’cause it’s their job. What are they worried about? Well, obviously, solar must be replaced after dark. But now, suppose you are PJM, looking at the 13-State chunk of the electric grid they are responsible for, in the mid-afternoon. You not only have to balance generation and load overall in that area, but also manage the flows between subregions so transmission lines and transformers don’t get overloaded. Your only tools are to increase or decrease generation in different locations — and to a very LIMITED extent, call on curtailable loads to drop off that have signed up in advance to do so — and of course in extremis, to dump load involuntarily (rolling blackout). OK, so as you watch, a big patch of rain ahead of a cold front rolls across the Mississippi River, and in minutes that sunny day across Indiana and Kentucky and moving into Ohio is replaced with clouds and rain. Meanwhile, in the humidity and heat ahead of that, big thunderstorms are forming into a line headed up the mountains and Piedmont. In this sort of situation a given solar farm will go from full output to zero in seconds. A whole bunch of solar in a region can drop off in minutes. Over a region as large as PJM there is quickstart generation somewhere that can be ramped up to replace it, but it has to be physically located where this new source of power won’t overload local transmission lines. All these operating decisions are what keep the grid stable. The problem with solar (and wind) is, it makes the entire grid operation more volatile; more “brittle,” more chaotic. The volatility with 10% solar grows exponentially with 20% solar, and again with 30% solar. All these scenarios are modeled by computer and at some point PJM says “if this happens we can’t control stability any longer” and why, and they analyze the probability of that and things like it happening, and at some point the probability, the risk, violates NERC reliability standards. That’s the upper limit for solar in PJM. In addition there are temporary lower limits imposed by the nature of the replacement generation that’s available today and where it’s located. All that stuff about the limited gas supply during a polar vortex event, for example. This has more to do with how fast we retire coal and nuclear and what replaces them; solar is simply a complicating factor. Dominion has reliability issues too but they are localized. Take that load pocket on the Peninsula. PJM is responsible for keeping the lights on across the grid, but it’s Dominion’s control center in Glen Allen that will carry out PJM’s instructions and that works with PJM on contingency planning. Suppose there’s a lot of solar built on the Peninsula (there isn’t, now) and lines into there are also fully loaded and now you lose all the solar due to big thunderstorms. Dominion would have to decide whether to use one of its precious remaining hours for operating Yorktown 3, or which loads to black out, and how to deal with the very-ticked-off customers and press. So should the utilities build solar? Should electric customers also build their own rooftop solar? Absolutely! Its environmental footprint is excellent, except for land taken out of agriculture, and that is reversible. Its fuel cost is excellent (zero!). But we use a high percentage of solar at a price in how we build and operate the rest of the grid. Why is saying we shouldn’t have too much solar gen a “bad thing” and a “misleading narrative”? Well, as discussed above, it’s true, so in fact it’s not “misleading” if argued properly. By that I mean, if NOT used as a scare tactic to deter customers and regulators from building as much solar as WILL be cost effective taking reliability into consideration. Lots of solar makes the grid more “brittle” to operate but there are measures the planners can take to offset that. More high efficiency quick-start gas units, for example, well dispersed; a stronger transmission backbone to move power around quickly; customer efficiency measures better insulation to cut down on after dark electricity peaks. At somewhere north of 30% solar these offsets probably cost more than the energy benefit from more solar. That’s a different kind of limitation due to reliability, but just as real. Does this help? There’s nuance here. Jim’s not “evil” unless he implies on Dominion’s behalf that solar is no good even at today’s levels. He’s not saying that at all. In fact, neither is Dominion. Dominion keeps on raising cautions and concerns, as they should, but that’s typical of a risk-averse business faced with change. No different, IMHO, than lots of businesses these days faced with internet competition, or news media faced with loss of print advertising, or our political parties faced with extreme polarization due to the collapse of shared mainstream sources of factual news. Dominion has not obstructed solar, they just haven’t done what some utilities elsewhere have done to promote it. Currently, they have no financial incentive to do so. But (and I can’t emphasize this enough) they DO have a strong corporate commitment to “public service,” which includes making customer-owned solar feasible and accommodating whatever the VSCC or GA says it wants or doesn’t want built (like NA3). any idea of keeping the oil-fired part of Yorktown as an emergency reserve? Re keeping oil-fired Yorktown — I expect they will. At some point it becomes too expensive to keep an old, labor intensive plant like that in service for such limited hours of use — but until the transmission (or some other generation inside the load pocket) is there to replace it, they don’t have any choice (they will never intentionally violate reliability standards which require them to be able to keep the lights on). Thank you for such a comprehensive response. I think Larry and I don’t fully understand what the other is saying at times. When he says “there is no way solar can cover the peaks”, I respond of course it can – it is happening in California right now. I think what he means to say is that it is not currently possible for solar to cover the peaks all of the time. This is a statement that I would agree with. My point is that currently Dominion (as shown in their 2016 IRP) is on track to go from about 0.1% solar to maybe 4% solar by 2030. I believe that this does not represent the best interests of the ratepayers. I think that we should embark on a path that will get us to 20%+ solar by 2030 and we should hold the line on adding more baseload gas plants. A point that I have not been able to successfully communicate to Larry is that we have enough baseload, intermediate load and peaking units to serve us reliably today. A good percentage of that capacity is gas-fired. If we use energy efficiency to keep our electricity demand stable, we have all of the necessary units to serve us reliably for the next 15 years without adding new ones. If we add new solar generation during that 15 year period we will lower our energy costs, because no one would put it in unless it was cheaper for them. When some or no solar output is available, we have all of the current units that can fill the gap. It is not an solvable puzzle for grid managers. As time goes on many of the technologies being developed today will become inexpensive and widely available. Low-cost storage and two-way flows of energy and information in the grid will make higher percentages of renewables mesh easily in the grid. My hope is that we can alter the regulations so that it will be easy for utilities to play an important and profitable role in our energy system without needing to build unnecessary projects or making it difficult for third-parties to serve customer interests. The only quibble I have with what you said is that storm fronts (which typically move in the tens of miles per hour) will not stop all solar output in Dominion’s territory in seconds or minutes over PJM’s. IBM and others have produced highly accurate forecasting tools for control centers, focusing on the effects on solar and wind output. These new tools give utility and ISO control centers ample notice to make appropriate adjustments in the generation mix. These few years of transition are the hardest, but big data and a digital grid will allow us to operate a much more diverse grid at even higher levels of reliability. The big issues at the moment are how to handle the rapid ramp up of conventional generation as large amounts of solar output declines (this is not an issue for us) and whether to keep investing in baseload units with the likely prospect of stable or declining demand (this is a major issue for us). Thanks, TomH, I agree especially with your last paragraph. Perhaps I stressed the weather effect too strongly but it was to make a point to LarryG: there are upper limits with solar that are not driven by having enough fossil generation or gas supply in the aggregate to carry the load after dark, but with system operations handling the transitions, sometimes sudden and during the day. Ramping also matters for wind. In fact, ramping requirements mean you simply can’t build slow-ramping cycling units any longer, even if they are otherwise more efficient. I am concerned about the construction of new gas units too, but this, it seems, really ought to be laid at regulators’ doorsteps. The financial incentive is still there to build these in the short run, replacing older, higher cost units that won’t run very often or earn much even if they do — and it makes sense so long as the ratepayer remains on the hook for any stranded cost that results. Take away that insurance policy and I think things would change fast. The VSCC has all the info it requires through the annual IRP process (including your submission) to tell DOM, any additional generation built by Dominion Energy shall be by and for DOM’s unregulated generation subsidiary, not for Dominion Virginia Power or Dominion North Carolina, not paid for by ratepayers. Then, if DOM really believes you are wrong and insists new gas has a 40-year useful life ahead, let ’em build it — run it for themselves, sell all its output to PJM if they can (including their existing gen or not), and buy all their customers’ requirements from PJM. That’s a gamble the regulators of DOM need to take and ought to step up to. I hope you make another pro se submission next year. Acbar – ”brittle solar”? Isn’t that term more applicable to utility scale solar, not distributed? I understand it is easier to integrate solar in smaller amounts than with large utility scale fields. As I have said before, there are lots of regulations in VA that have prevented on-site and community solar from being competitive. A few were recently changed but not significantly. The ‘compromise committee’ was sold a bill of goods favorable to Dominion. Now … my old saw – offshore wind. Virginia’s potential is huge. While some of our coast is restricted in Virginia, the SE region is still capable of generating between 150 and 250 MW in the initial years up to 2025. With rapid market growth the region could reach 900 MW/year in 2025 and 1,100 MW/year in 2030, about half of the average historical build-in rate for electricity in the region. The wind blows when you need it and Dominion could stay in charge of generation, which is what they want. The expensive part only means that the industry needs to be developed and Virginia has one of the right place to do that for the South East. If we wait, Savannah or Charleston will take the place Virginia harbor could fill. When offshore wind is commercially deployed in the United States, the industry will require a robust workforce ranging from approximately 20,000 to 60,100 jobs around the coastlines. Is Dominion only able to think gas and utility scale solar? No, solar cumulatively makes a grid ” brittle” — what kind or size (distributed or utility-scale) doesn’t matter. The important thing, though, is that these operating issues don’t matter as much if the amount of solar on a grid is, say, below 20% or so. Virginia has a LONG way to go to be in that range! So, Tom, As I understand it, you’re not saying that Dominion should shut down any of its existing natural gas facilities. You’re saying that Dominion should not build any more gas plants or nuclear plants, or extend the life of its existing nuclear plants. Solar can fill in for any retiring plants — up to 20% of capacity — without creating any reliability issues. Is that a fair summary? Yes, Jim. I have tried to keep it simple, for public understanding and ease of grid integration. Solar development can be timed to provide reliability and reduce stranded costs. Greensville would be the last baseload plant. An important component to remember is energy efficiency. We would need to reduce demand and have affordable storage (pumped storage and batteries) to not extend the life of the Surrey units in 2032. But there is a lot of time for technological advancement and declining costs to cover this. An effective energy efficiency program could provide equivalent generation much more quickly and at a fraction of the cost of a new or retrofitted nuclear unit. If I was wrong about the next 10 years, that is still sufficient time to build another combined-cycle unit to fulfill baseload requirements. I think this is the low-cost, low-risk approach. We meet demand without risking 40 years of ratepayers costs to cover new units that might or might not be economic or necessary. Yes, and I agree with both of you with one additional comment:. DOM is now and will remain free to build all the generation it wants to build through its unregulated generation subsidiary. If DOM truly believes PJM’s markets are going to come up short of gas-fired gen over the next 40 years, go on and build it now and make lots of money in those markets. But do it at DOM’s cost and risk, not DVP’s ratepayers’ cost — and at their risk of stranded cost. Just to back up my glib comment on building efficiency …. Energy efficiency is the 3rd largest power source in the U.S.
•	An 8/16 report from the American Council for an Energy-Efficient Economy (ACEEE) finds energy efficiency is currently the third largest electric power resource in the United States, and could grow to be the most significant by 2030. •	When it comes to the Clean Power Plan, ACEEE found most states could meet a quarter of their emissions reduction targets through efficiency policies and the resulting investments, while some could achieve 100%. •	According to ACEEE, a well-designed set of efficiency policies could help the United States avoid a total of 800 power plants by 2030, meaning 1 billion tons fewer annual carbon dioxide emissions by 2030. We in Virginia are near the bottom of the state list in taking advantage of this resource. we agree.. I’m not good at getting my point across..
which I suspected.. which means that every watt of solar we generate is that much less gas that needs to be burned.. as long as that gas is ready to take over when the solar drops. so having enough gas to carry the load above which baseload is not able – gives us the ability to incorporate solar – to the level of what gas can generate but no more than that because then it would be excess to baseload. we agree. .. I’m just terrible at articulating ..
thank Acbar and CAW for really excellent commentary that does inform!!! I still think Jim is evil when he continue to carry anti-solar water for Dominion! Dominion is not working in the interests of ratepayers nor utilizing solar to it’s full potential… I can only assume because it’s not in their best financial interests but Jim ought to be saying that – not spinning for Dominions excuses for not moving forward on solar. Re: “Dominions excuses for not moving forward on solar” — the problem is how Dominion should proceed. Some people here don’t like Dominion building or buying utility-scale solar — well then what should it do? The main reason there’s more solar in NC is because of State tax credits — that’s not a Commission or Dominion policy. There is nothing in Dominion’s tariff that needs to change for Virginia solar to take off. I know this may get a rise out of TomH, who favors two subsidies for solar that we DONT have in Virginia: net metering, and 3d party sales financing (where rooftop solar is built at subsidized or zero cost by the equipment-manufacturer/developer in exchange for a contract with the customer to buy the solar power at a price that gives the developer a profit (although less than what the customer would have paid the utility for the same amount of power). Dominion reluctantly allows net metering only for small installations; and Dominion has resisted 3d party sales as a violation of its exclusive franchise to sell at retail within it’s service territory. Of course Dominion has no control over the customer building solar for himself, and I continue to believe the solar vendors can figure a way to sell and install their equipment without tying the financing to future retail sales. In general, however, Dominion is not the obstacle to solar in Virginia. They (and the GA) just aren’t pushing it very hard, either. Unless you like utility-scale, utility-owned solar, which some folks here don’t. to promote this narrative that solar is not “dispatchable” . therefore is not a reliable source .. and Jim repeats it – and it’s just not a fair representation of the reality. Solar is a VALUABLE and cost-effective fuel that can displace the need to use gas – when solar is available. Every watt of solar “harvested” is a watt that does not have to be generated by gas, yet Dominion keeps peddling this tripe about it not being “dispatchable” as if that negates it’s value. As TomH has demonstrated – we have enough gas to burn it 24/7 when demand exceeds baseload. That means we can use solar – but fall back on gas if need be. that does not make solar “unreliable” any more or less than baseload is not “reliable” for peak loads… it’s not a binary proposition for baseload or solar.. each has it’s own value in the mix. if you think about it – baseload is not “dispatchable” either – it cannot be brought online (dispatched) quick enough to respond to higher demand.. that’s where gas comes in… but gas also comes in when solar fades. I just wanted to thank everyone for their contributions to this discussion. Our give and take helps clarify the issues. I am not a big fan of net metering. I think it is a crude tool. I am much more in favor of a value of solar tariff. A VOS tariff accurately and objectively identifies the benefits and costs of adding solar in a particular zone in the grid and any new solar in that zone is paid or charged more according to its contribution. Utilities would identify those zones that would benefit by having more local generation. This would incentivize development of solar in those areas where it could contribute the most. Solar could still be installed anywhere but it would pay its own way wherever it was developed and there would be no cross subsidies by other ratepayers. Solar additions where it is especially valuable would be paid fairly instead of some standard fee that the utility comes up with. I do support third-parties in at least being able to take the tax credit for installations for schools and government buildings that would not otherwise qualify for it. This would give non-profit organizations the same benefit that other types of businesses get. The solar lessor would create a capital lease (dollar-buyout at the end of the term) that is used for many other types of equipment. I would also support solar PPAs that could supply customers with solar energy from a remote location. As long as the utilities were fairly paid for the cost of using their wires and any billing services that they provide. If utilities were relieved of the pressure of having to sell more electricity in order to profit, this should work out fine. Good discussion. In concept I am not offended by VOS the way I am by net metering. Mainly because its own success changes the calculation and reduces the subsidy, eventually to zero. The problem with n.m. is that it becomes baked-in with an entire industry opposing ramp-down or repeal; the subsidy long outlives the problem. As for 3d party sales, the simplest solution is the best: bring retail access back to Virginia! is that true? is it a gas-fired plant ? Why would it be characterized as baseload if it can ramp up and down fairly quickly – unlike coal/nukes? If it’s efficient enough to be dispatched 24/7 for economic reasons, it will be, and therefore it won’t be cycled off even though it has that capability. “Baseload” is a description of how something is used not a limitation on how it can be used. Except we do use the term in both senses sometimes. Think of autos. What is an “off-road” vehicle? Does it always get used off the road? How much is its street usefulness compromised by features that never get used by the typical soccer mom? No, it’s just a regular car with an insurance policy for snow days built in. But people still call it an off-road SUV. Like that 4wd feature, the ability to cycle a gas unit may take away a little efficiency yet not get used very often today, but 20 years from now that may make the difference between a useful plant and a stranded cost. Today it may operate as baseload, but if it can operate as a cycling unit tomorrow, that may spare it from premature retirement. except , UNLIKE coal/nuke baseload, it CAN modulate and thus IS compatible with solar – and the more solar you have the less you have to burn that gas for baseload. If Dominion has that ability – they can do SOLAR! Oh absolutely, yes. They CAN do solar. Everyone in PJM can do solar. Which means, everyone in PJM can do the backup for solar. That’s Dominion’s ploy, I guess. Let others build most of the solar and they will build high efficiency cycling n.g. units to make their money at night backing up the solar. Remember, with a strong grid, the balance of generation within any particular company’s system doesn’t matter much any more; it’s the balance across the whole grid (PJM’s part anyway) and each utility or independent generator on that grid builds what the grid as a whole is short of. Just read this … “A team of solar and battery storage veterans is forming a new development group aimed at a broad range of sectors within the evolving American utility-scale PV market, including dispatchable solar paired with storage. The group, called Lightsource North America, is an arm of Lightsource Renewable Energy, a 300-employee solar developer with a portfolio of 1,700 megawatts of projects throughout Europe. Lightsource is a vertically integrated developer that originates, finances, owns and operates large solar power plants. According to the article, they are doing combined solar plus grid-scale battery deals. You can dispatch solar collectors down, but only the storage part can dispatch up when it’s dark outside. OK, solar is getting to the point where it is competitive to build without subsidies. Batteries? Not yet, except in niche situations. I give these guys credit for exploring the possibilities — but not on my dollar. We need a revolution in battery technology first. It will happen — but for 40 years it’s been “just 10 years away”! still not a believe that “storage” is cost-effective and ready for prime time but will admit that when it happens – the world as we know it -changes. And the first places we will see real change are the islands that currently use fuel oil to generate electricity at around 50 cent kwh. if those islands can use solar – and store it for nighttime for less than 50 cents kwh – the world changes. An article in REW shares your skecptism … ” No country will ever get to 100 percent renewable energy without using geothermal, biomass, hydropower or a combination of the three. These technologies are able to provide energy around the clock, (baseload) and do not depend on the sun shining or the wind blowing. The one exception to this rule is hydropower, which can have its output reduced or increased during seasonal fluctuations in water supply. For the most part, however, it is only with these baseload renewable energy sources that countries can ever hope to become completely powered by renewables sectors. However, the islands ARE getting started doing solar and storage …. Pretty cheaply too. The Kapaia installation includes a 13-megawatt solar system and 52 megawatt-hours of batteries that can store energy during the day and dispatch it after the sun goes down, the Palo Alto, California-based company said Wednesday. Tesla has a 20-year contract with the Kauai Island Utility Cooperative on the island of Kauai to deliver electricity at 13.9 cents per kilowatt-hour. That’s lower than the utility’s cost for power from diesel plants of 15.48 cents, and about half the 27.68 cents that consumers paid in December for electricity in the state. Hawaii is one of those niche situations where regular fossil generation is so expensive, it creates a giant test kitchen to cook up alternatives that won’t make economic sense on the Continent until years later. I agree that Kaua’i is different from Virginia because of their high amount of sunlight and very high rates, but they are providing an early proving ground for this technology. I don’t think it will take as long as you believe it will for this virtual power plant technology (solar plus batteries) to take hold on the mainland. It is happening in California now. Look at how fast the cost is coming down in Kaua’i – the Tesla Project (13 MW solar plus 52MWh batteries) at 13.9 cents/kWh in 2017, the AES project on Kaua’i scheduled for 2018 installation (28 MW solar plus 20 MW of 5-hour batteries) at just 11 cents/kWh. That is a 22% price decline in just one year. The industry cannot assume the same slow incremental progress that has been the norm in the utility business will apply to the modern energy technologies. This is the point I have been trying to make. These new technologies are coming and they are coming fast. We need to have the regulatory structures and other policies in place soon in order to make the best use of them and protect our utilities and ratepayers from faulty decisions based on past practices. I’m still a skeptic when it comes to lithium battery based bulk power storage. They use expensive components and are inherently unstable unless extremely pure ingredients and manufacture are employed, battery-grade graphite is relative scarce, the social/environmental cost of cobalt mining is notorious, and their recharging life cycle is not that good. There are so many better technologies in the pipeline! When one of them arrives commercially, we’re talking a very different story. The same point applies to electric vehicles. And to electric vehicles plugged in as grid batteries at night. I’m all for Tesla and so forth getting their feet wet using what’s available now so they can swim faster when the Big Battery Upgrade comes. But it takes a high opportunity cost environment like the electric system on an isolated island in the Pacific Ocean to sustain the “early proving ground” experiment today, and that’s just not the cost environment the rest of us are living in. You are right, of course, even lithium battery costs are declining rapidly with volume and manufacturing efficiency. California, however, IMHO is an aberration, a creature of unsustainable market distortions by government subsidies they don’t have the political will to reign in. Some good things have come out of the California solar subsidy experiment but not enough to pay for it all. But we agree on your last paragraph. The new technologies are coming fast. Past is not prologue when it comes to the future grid. The situation in Kaua’i is for peak load shifting. Moving solar output from daytime to the evening peak. Lithium batteries work well for a 4-5 hour period. Lithium batteries get a much more strenuous workout in Tesla’s automotive application than they do in this electric grid situation and they are performing well. But you are right, if we want to use batteries as a true baseload replacement we need better batteries. Flow batteries have some advantages but some problems too. But there is a large amount of research in this sector and I think they have 10 years or so to figure it out, which is a great deal of time in the tech sector. Here is a link to Ivy Main’s summary of recent rulings regarding third-party solar in Virginia. This is an improvement over past policies but it still a door that is open a tiny crack that can be slammed shut a any time. I am still puzzled as to why you consider Virginia as a free and open state for third-party solar installers.